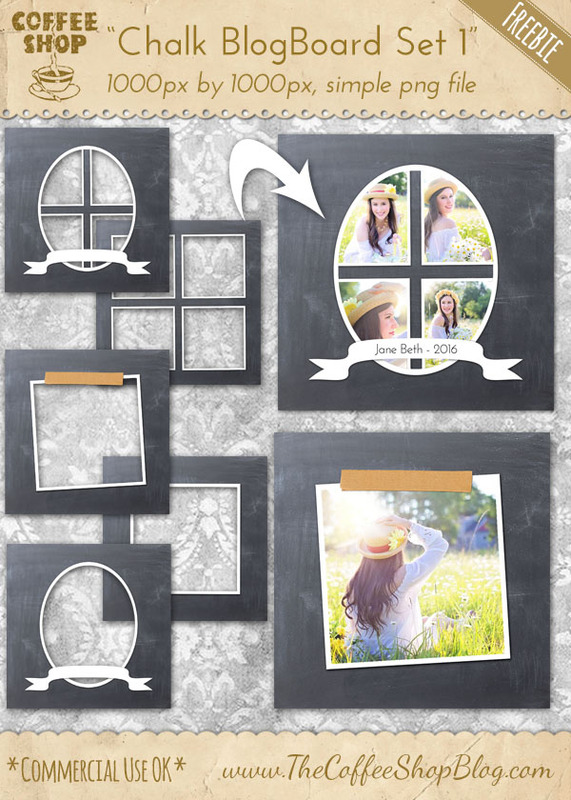 The CoffeeShop Blog: CoffeeShop Photographer Storyboards: "Chalkboard BlogBoard Set #1!" CoffeeShop Photographer Storyboards: "Chalkboard BlogBoard Set #1!" I hope all of my American readers had a wonderful 4th of July! Today I put together a really nice set of five chalkboard blogboards. These are 1000px by 1000px and are simple png files, so you simply drag your images underneath the board and free-transform them (Ctrl-T) to shape. These photographer blog boards are perfect to display your favorite images on websites, blogs, and social media. You can also add them to storyboards or cards and have them printed or post them on your website. In my storyboard examples above I used some gorgeous images by Jill Wellington (Etsy Shop, Facebook, Blog, YouTube Videos, Pixabay). Download the CoffeeShop Chalk BlogBoard Set #1. You can also download it here. You are so welcome Angela! Thank you. I wonder if you have psd versions available? I would like to be able to remove the wash tape and or the banner. I like the chalkboard background do you have a solid one available? Lois, I didn't create psd versions for posting because the files were too huge. I can make the two versions without tape and the banner if you want. And I can't remember where I found the chalkboard texture. I know I can use it on my designs but without the link I don't feel comfortable posting it unedited for download. If I find the original source I will post a link here. Thx, Rita. I really love all the wonderful items you create.